Coloring Books filled with Fairy Tale images is a natural and one of the most popular searches on the page. Explore our favorite selections from illustrators around the world bringing your favorite Fairy Tale to life that go beyond Disney. Korean artist Jae-Eun Lee does absolutely GORGEOUS illustrations and her coloring books have just been released in the US / UK Market. We are so excited to be able to share them. Please note that these books are not based on the Disney versions of these Fairy Tales but on the original books. Color your way into the Beast’s heart, in this visual retelling of the classic French fairy tale, Beauty and the Beast. The images are suited to more advanced colorists that enjoy details with tiny spaces and areas to shade. It is a two sided book with the classic story told on various pages throughout and non perforated. The paper is a quite nice heavyweight suitable for pencils, water based markers or gel pens (be sure to leave time to dry). Alcohol pens will bleed through to the other side of the paper. Always put a piece of paper behind your work just in case and use the pages at the back of the book to test your particular pens. This paper and supplies review is for all of Jae-Eun Lee ‘s Fairy Tale coloring books. The book has double sided non-perforated pages with nice thick paper that takes pencils quite nicely for shading and blending. Water-based markers won’t bleed nor will gel pens. Please test your variety of coloring mediums on a back page just to be sure, you won’t want to wreck this gorgeous plunge down the rabbit hole. The Wizard of Oz takes colorists down the nostalgic yellow brick road, reimagining many of the story’s beloved characters in Jae-Eun Lee’s whimsical and highly-detailed illustrations. Enjoy hours of calming creativity as you re-experience this classic story like you’ve never seen it before. This book is being released on June 7, 2016 but you can pre-order now. This book will likely follow the format of Alice in Wonderland and Beauty and the Beast by the same illustrator. The latest fairy tale coloring book in illustrator Jae-Eun Lee ‘s pretty line of colouring books depicting a lesser known fairy tale in splendid detail. The Snow Queen invites colorists into the world of Gerda and Kai, two young friends whose lives are changed when they come across a magic mirror. Kai is whisked away by the beautiful Snow Queen, and Gerda must travel to her castle to rescue him. Artist Jae-Eun Lee bewitchingly renders the characters, landscapes, and settings from the classic tale in an unforgettable coloring book rendition. The Snow Queen is available for pre-order on Amazon and will be available August 9, 2016. The first of Jae-Eun Lee ‘s coloring books isn’t as well received as the previously highlighted one’s because it doesn’t have as many pages to color as it does those that just illustrate the words of the story but the images included are fabulous so if you are an Anne of Green Gables fan you might want to check it out as well. Tomoko Tashiro has illustrated several absolutely gorgeous coloring books. The one I just purchased is “Fairy Tale Coloring Book.” The illustrations are completely gorgeous, however, unless you like to color in very tiny detailed places this book may not be for you. I adore looking at other peoples’ colorings in this book but discovered it’s just not MY particular happy place to color in. Your results may vary. Little Red Riding Hood. Hansel and Gretl. Snow White and the Seven Dwarfs are included in this book. Color in beloved characters and scenes from your favorite fairy tales, along with fantasy-filled flowers, animals, and landscapes. Rapunzel, Hansel and Gretel, Cinderella, Sleeping Beauty, Snow White, We’ve known these characters since we were children, but in this elegant new coloring book, these characters are waiting to be brought back to vivid life, through coloring. Based off of the masterpieces of the Brothers Grimm, acclaimed British artist Adam Fisher has created a black and white wonderland just waiting to be filled in. The paper in this book is average weight meaning, markers will most likely bleed through and it is a 8×8 single sided book so you could use markers if you put a piece of paper behind your work. Grimm Fairy Tales Adult Coloring Book – Join in the adventure and escape by coloring the lines of the world’s most recognizable characters. From Red Riding Hood to Cinderella, Little Mermaid to Robyn Hood, and OZ to Wonderland. Let your brain focus on creating great pieces of artwork while relieving the stress of everyday life. Hone your coloring skills by collaborating with some of the best artists in the comic book industry such as Jamie Tyndall ,J. Scott Campbell,Dawn McTigue , and many more. Grimm Fairy Tales’ adult coloring book provides hours of great art to be filled with your imagination! Relive your childhood passion of coloring and fairy tales all in one unique book! My Review, I adore the images in this book unfortunately the paper is just awful if you are a person who uses colored pencils for layering. You are going to need to copy your favorite images over to card stock! is one I’ve been anxiously awaiting the release of. Japanese coloring books are quite different in style from their American and English counterparts and have delicate intricate designs in them, not recommended for new colorists unless you are up for a challenge or just want to gaze at the beautiful illustrations while you are learning colorist skills. The book is printed double sided with medium paper, not recommended for alcohol markers as they will bleed through. Test all coloring materials on back pages before you try them on your project. According to reviews, the binding lays flatter on the US version but the paper is nicer in the Japanese version so you can take your pick. See my personal review of the US version above. Our UK Coloring Book reviewer Kemberlee Shortland is quite pleased with the Good Wives & Warriors Colouring Book. Here’s what she has to say. I not a huge Alice in Wonderland fan, but the story does take me back to my early years. Seeing a colouring book with this theme seemed like a lot of fun. I found a copy on the shelf of my local bookstore and decided to give it a go. This is a smaller book than traditional books…a little more than 18cm/7 inches square. Seemed tiny compared to the larger books I’ve been coloring in, but actually turned out to be wonderfully manageable for when I color while sitting on the sofa. I enjoyed most of the quirky designs. Many are distinctly Wonderland inspired, while some are from the designer’s imagination. A few are a little weird, but fitting with the theme, although not directly taken from the book. There is a good balance between easy and more difficult options which I liked. The paper is thicker stock which means I can press harder and not destroy paper integrity. I used Prismacolor Premier Colored Pencils and they worked a treat on this paper. Again, paper quality showed up when I needed to erase the color…the black lines didn’t smudge or erase off with the pencil color. While the page held onto some of the color, this is natural for most pencils. Because this is a more rugged paper, I was able to lay down several colors when blending and saw little bloom from my soft pencils until I had over-layered the colors. I tested pen bleed-through in a superfluous page in the book. Colored gel pens didn’t bleed-through, but felt tip pens did slightly…areas where I went over twice for better coverage. What helps protect from this happening is laying down a similar color in hard pencil, then putting the ink on top. The bleed-through is minimal. The pages aren’t perforated, and images are printed on both sides, which makes it difficult to pull out a page one may want to frame, if the colourer likes both back-to-back images. For me, I like most of my colouring to remain in the book so it’s not really an issue for me, other than needed a clean sheet of paper between pages when coloring against previously coloured images. My overall rating for this book comes from an average based on the following qualities and personal experience. 0 to 5, with 5 being the best. Will I colour in this book again? Undoubtedly! Can’t wait to get my Shakespeare book next! 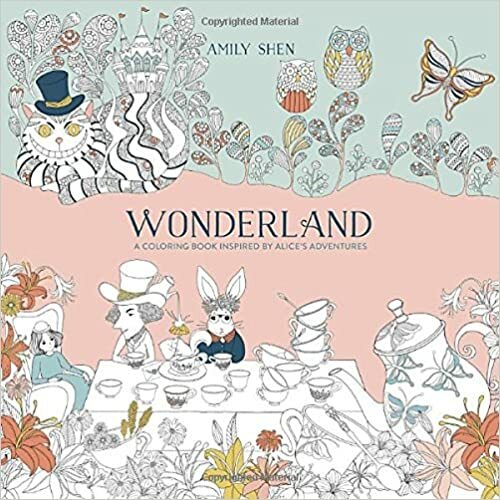 Based on the iconic drawings by Sir John Tenniel, this adult coloring book contains fifty-five illustrations that are printed on heavy paper suitable for pencils, markers, and watercolors. The tear-out pages, which fit into a 6 x 8-inch frame, let you share and display your love of all things Alice. This grayscale coloring book pictures the dark side of Alice and is yet another version of Alice in Wonderland. Have you ever wondered what would have happened if Alice hadn’t drunk from the bottle labelled ‘Drink Me’, or if she hadn’t joined the Hatter, the March Hare, and the Dormouse for tea? Well now you can find out – and take part. In Alice’s Nightmare in Wonderland Colouring Book – a companion to Jonathan Green’s new Choosable Path Adventure Book – YOU decide how the amazing creatures Alice encounter should appear. Because this is your chance to team up as the colourist for illustrator Kev Crossley of 2000AD, KISS 4K and Warhammer 40K fame. Are you ready to join Jonathan Green and Kev Crossley and go back down the rabbit-hole? Amily Shen is a renowned Taiwanese artist. She had worked as a custom and shoe designer and is now a full-time illustrator and art instructor. She has published three bestselling drawing books. WONDERLAND is her first adult coloring book. This finely detailed beautiful book would be suited to an intermediate to advance colorist who enjoys tiny details. Do you know how we can make suggestions for future Disney coloring books?